Nothing beats the feeling of the wind on your face as you ride down the road on a motorcycle. However, doing so without the proper insurance policy can put you at risk for fines, liability suits, and costly out-of-pocket expenses. Before you purchase a policy, it’s important that you understand the unique requirements Alabama places on motorcycle drivers. Here’s a brief explanation of what types of motorcycles need insurance and the coverage each rider should have. What Is the Definition of a Motorcycle in Alabama? In some states, motorcycles, motorized bicycles, and scooters are classified differently. However, in Alabama, a motorcycle is defined as any vehicle with two or three wheels, a seat, and an engine. This means every motorcycle, scooter, or moped on the road needs to have a valid insurance policy to be legal, regardless of the engine size. 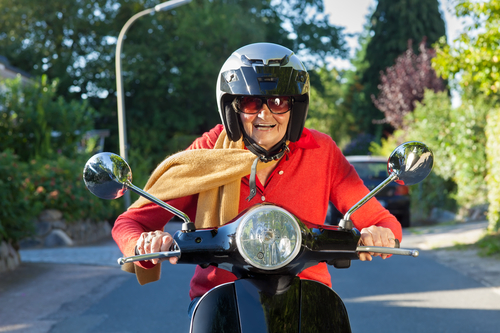 If you’re moving from out of state with a 50 cubic centimeter (cc) scooter that previously did not need to be insured or registered with the state, you’ll need to purchase coverage. Unlike other states, Alabama also requires converted bicycles driven by gas-powered engines to have coverage if they have a 150 cc engine or higher. Furthermore, if the bike weighs more than 200 pounds, even if it has pedals, it must be insured and registered as a motorcycle. Bikes that fall below those thresholds can be driven safely without insurance. As with every motorized vehicle, there are minimum liability requirements you must meet for your bike to be registered with the state. The government expects riders to have at least $25,000 injury liability, $50,000 for all injuries the other driver and their passengers experience, and $25,000 property damage insurance to cover the cost of the other driver’s repairs. The coverage limits are per accident, so you will have continued liability protection throughout the year. Keep in mind, however, that the minimum coverage will likely be the most affordable option, and it only protects other drivers if you are at fault for the accident. All associated repairs and medical treatments you or your passengers receive will be your responsibility. If you’re looking to protect both your bike and yourself, you’ll need a more comprehensive policy. If you need insurance for your new motorcycle or scooter, contact the team at Aaron Insurance Agency in Dothan, AL. Their dedicated staff will work to find you the best coverage for your needs and riding habits. Learn more about their services online, and call (334) 712-0777 to speak with an insurance agent today.